"Lettering" redirects here. For lettering in technical drawing, see Technical lettering. For lettering in comic books, see letterer. "Calligrapher" redirects here. For the novel, see The Calligrapher. Modern calligraphy ranges from functional inscriptions and designs to fine-art pieces where the letters may or may not be readable. Classical calligraphy differs from typography and non-classical hand-lettering, though a calligrapher may practice both. Calligraphy continues to flourish in the forms of wedding and event invitations, font design and typography, original hand-lettered logo design, religious art, announcements, graphic design and commissioned calligraphic art, cut stone inscriptions, and memorial documents. It is also used for props and moving images for film and television, testimonials, birth and death certificates, maps, and other written works. A calligraphic pen head, with parts names. The principal tools for a calligrapher are the pen and the brush. 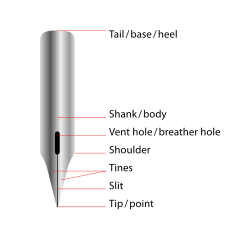 Calligraphy pens write with nibs that may be flat, round, or pointed. For some decorative purposes, multi-nibbed pens—steel brushes—can be used. However, works have also been created with felt-tip and ballpoint pens, although these works do not employ angled lines. There are some styles of calligraphy, like Gothic script, which require a stub nib pen. Writing ink is usually water-based and is much less viscous than the oil-based inks used in printing. High quality paper, which has good consistency of absorption, enables cleaner lines, although parchment or vellum is often used, as a knife can be used to erase imperfections and a light-box is not needed to allow lines to pass through it. Normally, light boxes and templates are used to achieve straight lines without pencil markings detracting from the work. Ruled paper, either for a light box or direct use, is most often ruled every quarter or half inch, although inch spaces are occasionally used. This is the case with litterea unciales (hence the name), and college-ruled paper often acts as a guideline well. Folio 27r from the Lindisfarne Gospels (c.700) contains the incipit from the Gospel of Matthew. Western calligraphy is recognizable by the use of the Latin script. The Latin alphabet appeared about 600 BC, in Rome, and by the first century developed into Roman imperial capitals carved on stones, Rustic capitals painted on walls, and Roman cursive for daily use. In the second and third centuries the uncial lettering style developed. As writing withdrew to monasteries, uncial script was found more suitable for copying the Bible and other religious texts. It was the monasteries which preserved calligraphic traditions during the fourth and fifth centuries, when the Roman Empire fell and Europe entered the Dark Ages. At the height of the Empire, its power reached as far as Great Britain; when the empire fell, its literary influence remained. The Semi-uncial generated the Irish Semi-uncial, the small Anglo-Saxon. Each region developed its own standards following the main monastery of the region (i.e. Merovingian script, Laon script, Luxeuil script, Visigothic script, Beneventan script), which are mostly cursive and hardly readable. 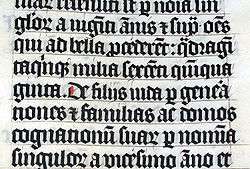 Calligraphy in a Latin Bible of 1407 on display in Malmesbury Abbey, Wiltshire, England. This bible was hand written in Belgium, by Gerard Brils, for reading aloud in a monastery. Christian churches promoted the development of writing through the prolific copying of the Bible, particularly the New Testament and other sacred texts. Two distinct styles of writing known as uncial and half-uncial (from the Latin "uncia," or "inch") developed from a variety of Roman bookhands. 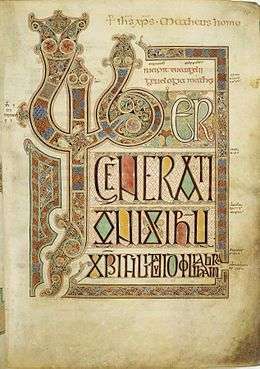 The 7th-9th centuries in northern Europe were the heyday of Celtic illuminated manuscripts, such as the Book of Durrow, Lindisfarne Gospels and the Book of Kells. Charlemagne's devotion to improved scholarship resulted in the recruiting of "a crowd of scribes", according to Alcuin, the Abbot of York. Alcuin developed the style known as the Caroline or Carolingian minuscule. The first manuscript in this hand was the Godescalc Evangelistary (finished 783) — a Gospel book written by the scribe Godescalc. Carolingian remains the one progenitor hand from which modern booktype descends. The Georgian calligraphy is centuries-old tradition of an artistic writing of the Georgian language with its three scripts. In the 15th century, the rediscovery of old Carolingian texts encouraged the creation of the humanist minuscule or littera antiqua. The 17th century saw the Batarde script from France, and the 18th century saw the English script spread across Europe and world through their books. In the mid-1600s French officials, flooded with documents written in various hands and varied levels of skill, complained that many such documents were beyond their ability to decipher. The Office of the Financier thereupon restricted all legal documents to three hands, namely the Coulee, the Rhonde, (known as Round hand in English) and a Speed Hand sometimes simply called the Bastarda. While there were many great French masters at the time, the most influential in proposing these hands was Louis Barbedor, who published Les Ecritures Financière Et Italienne Bastarde Dans Leur Naturel circa 1650. With the destruction of the Camera Apostolica during the sack of Rome (1527), the capitol for writing masters moved to Southern France. By 1600, the Italic Cursiva began to be replaced by a technological refinement, the Italic Chancery Circumflessa, which in turn fathered the Rhonde and later English Roundhand. In England, Ayres and Banson popularized the Round Hand while Snell is noted for his reaction to them, and warnings of restraint and proportionality. Still Edward Crocker began publishing his copybooks 40 years before the aforementioned. Sacred Western calligraphy has some special features, such as the illumination of the first letter of each book or chapter in medieval times. A decorative "carpet page" may precede the literature, filled with ornate, geometrical depictions of bold-hued animals. The Lindisfarne Gospels (715–720 AD) are an early example. As with Chinese or Islamic calligraphy, Western calligraphic script employed the use of strict rules and shapes. Quality writing had a rhythm and regularity to the letters, with a "geometrical" order of the lines on the page. Each character had, and often still has, a precise stroke order. Unlike a typeface, irregularity in the characters' size, style, and colors increases aesthetic value, though the content may be illegible. Many of the themes and variations of today's contemporary Western calligraphy are found in the pages of The Saint John's Bible. A particularly modern example is Timothy Botts' illustrated edition of the Bible, with 360 calligraphic images as well as a calligraphy typeface. Several other Western styles use the same tools and practices, but differ by character set and stylistic preferences. For Slavonic lettering, the history of the Slavonic and consequently Russian writing systems differs fundamentally from the one of the Latin language. It evolved from the 10th century to today. The Chinese name for calligraphy is shūfǎ (書法 in Traditional Chinese, literally "the method or law of writing"); the Japanese name shodō (書道, literally "the way or principle of writing"); the Korean is seoye (Korean: 서예/書藝, literally "the art of writing"); and the Vietnamese is Thư pháp (書法, literally "the way of letters or words"). The calligraphy of East Asian characters is an important and appreciated aspect of East Asian culture. In ancient China, the oldest Chinese characters existing are Jiǎgǔwén(甲骨文) characters carved on ox scapulae and tortoise plastrons, because the dominators in Shang Dynasty（商朝） carved pits on such animals' bones and then baked them to gain auspice of military affairs, agricultural harvest, or even procreating and weather. During the divination ceremony, after the cracks were made, the characters were written with a brush on the shell or bone to be later carved. (Keightley, 1978). With the development of Jīnwén (Bronzeware script) and Dàzhuàn (Large Seal Script) "cursive" signs continued. Moreover, each archaic kingdom of current China had its own set of characters. In Imperial China, the graphs on old steles—some dating from 200 BC, and in Xiaozhuan style—are still accessible. About 220 BC, the emperor Qin Shi Huang（秦始皇）, the first to conquer the entire Chinese basin, imposed several reforms, among them Li Si's character unification, which created a set of 3300 standardized Xiǎozhuàn（小篆） characters. Despite the fact that the main writing implement of the time was already the brush, few papers survive from this period, and the main examples of this style are on steles. The Lìshū（隶书） style (clerical script) which is more regularized, and in some ways similar to modern text, have been also authorised under Qin Shi Huangdi. 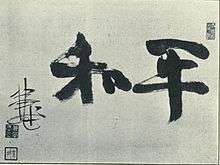 Kǎishū style (traditional regular script)—still in use today—and attributed to Wang Xizhi (王羲之, 303–361) and his followers, is even more regularized. Its spread was encouraged by Emperor Mingzong of Later Tang (926–933), who ordered the printing of the classics using new wooden blocks in Kaishu. Printing technologies here allowed a shape stabilization. The Kaishu shape of characters 1000 years ago was mostly similar to that at the end of Imperial China. But small changes have been made, for example in the shape of 广 which is not absolutely the same in the Kangxi Dictionary of 1716 as in modern books. The Kangxi and current shapes have tiny differences, while stroke order is still the same, according to old style. Styles which did not survive include Bāfēnshū, a mix made of Xiaozhuan style at 80%, and Lishu at 20%. Some variant Chinese characters were unorthodox or locally used for centuries. They were generally understood but always rejected in official texts. Some of these unorthodox variants, in addition to some newly created characters, compose the Simplified Chinese character set. Traditional East Asian writing uses the Four Treasures of the Study (文房四寶/文房四宝): the ink brushes known as máobǐ (毛笔) to write Chinese characters, Chinese ink, paper, and inkstone, known as the Four Friends of the Study (Korean: 문방사우) in Korea. In addition to these four tools, desk pads and paperweights are also used. The shape, size, stretch, and hair type of the ink brush, the color, color density and water density of the ink, as well as the paper's water absorption speed and surface texture are the main physical parameters influencing the final result. The calligrapher's technique also influences the result. The calligrapher's work is influenced by the quantity of ink and water he lets the brush take, then by the pressure, inclination, and direction he gives to the brush, producing thinner or bolder strokes, and smooth or toothed borders. Eventually, the speed, accelerations, decelerations of the writer's moves, turns, and crochets, and the stroke order give the "spirit" to the characters, by greatly influencing their final shapes. Cursive styles such as xíngshū (semi-cursive or running script) and cǎoshū (cursive or grass script) are less constrained and faster, where more movements made by the writing implement are visible. These styles' stroke orders vary more, sometimes creating radically different forms. They are descended from Clerical script, in the same time as Regular script (Han Dynasty), but xíngshū and cǎoshū were used for personal notes only, and never used as a standard. The cǎoshū style was highly appreciated in Emperor Wu of Han reign (140–187 AD). Examples of modern printed styles are Song from the Song Dynasty's printing press, and sans-serif. These are not considered traditional styles, and are normally not written. Japanese and Korean calligraphies were greatly influenced by Chinese calligraphy. The Japanese and Korean people have also developed specific sensibilities and styles of calligraphy. For example, Japanese calligraphy go out of the set of CJK strokes to also include local alphabets such as hiragana and katakana, with specific problematics such as new curves and moves, and specific materials (Japanese paper, washi 和紙, and Japanese ink). In the case of Korean calligraphy, the Hangeul and the existence of the circle required the creation of a new technique which usually confuses Chinese calligraphers. Temporary calligraphy is a practice of water-only calligraphy on the floor, which dries out within minutes. This practice is especially appreciated by the new generation of retired Chinese in public parks of China. These will often open studio-shops in tourist towns offering traditional Chinese calligraphy to tourists. Other than writing the clients name, they also sell fine brushes as souvenirs and lime stone carved stamps. Since late 1980s, a few Chinese artists have branched out traditional Chinese calligraphy to a new territory by mingling Chinese characters with English letters; notable new forms of calligraphy are Xu Bing's square calligraphy and DanNie's coolligraphy or cooligraphy. Mongolian calligraphy is also influenced by Chinese calligraphy, from tools to style. 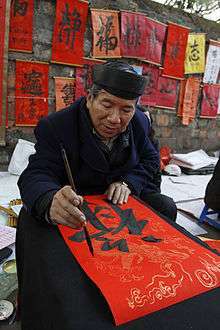 Calligraphy has influenced ink and wash painting, which is accomplished using similar tools and techniques. Calligraphy has influenced most major art styles in East Asia, including ink and wash painting, a style of Chinese, Korean, Japanese painting, and Vietnamese painting based entirely on calligraphy. Aśoka's edicts (c. 265–238 BC) were committed to stone. These inscriptions are stiff and angular in form. Following the Aśoka style of Indic writing, two new calligraphic types appear: Kharoṣṭī and Brāhmī. Kharoṣṭī was used in the northwestern regions of India from the 3rd century BC to the 4th century of the Christian Era, and it was used in Central Asia until the 8th century. In many parts of ancient India, the inscriptions were carried out in smoke-treated palm leaves. This tradition dates back to over two thousand years. Even after the Indian languages were put on paper in the 13th century, palm leaves where considered a preferred medium of writing owing to its longevity (nearly 400 years) compared to paper. Both sides of the leaves were used for writing. Long rectangular strips were gathered on top of one another, holes were drilled through all the leaves, and the book was held together by string. Books of this manufacture were common to Southeast Asia. The palm leaf was an excellent surface for penwriting, making possible the delicate lettering used in many of the scripts of southern Asia. Burnt clay and copper were a favoured material for Indic inscriptions. In the north of India, birch bark was used as a writing surface as early as the 2nd century AD. Ranjana script is the primary form of Nepalese calligraphy. The script itself, along with its derivatives (like Lantsa, Phagpa, Kutila) are used in Nepal, Tibet, Bhutan, Leh, Mongolia, coastal Japan, and Korea to write "Om mani padme hum" and other sacred Buddhist texts, mainly those derived from Sanskrit and Pali. 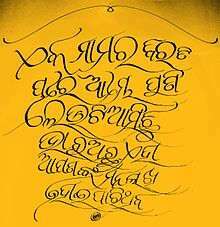 Sanskrit is the primary form of Thai calligraphy. Historically Thai calligraphy has been limited to sacred texts of the Pali Canon with few wider artistic applications where graphic calligraphy representing figures and objects is produced. Calligraphy appears on the personal flag of each member of the Thai royal family bearing its owner's initials in calligraphy. The most obvious place in the country where calligraphy is present is in graffiti. A few books have been published with calligraphic compositions. Calligraphy is central in Tibetan culture. The script is derived from Indic scripts. The nobles of Tibet, such as the High Lamas and inhabitants of the Potala Palace, were usually capable calligraphers. Tibet has been a center of Buddhism for several centuries, and that religion places a great deal of significance on written word. This does not provide for a large body of secular pieces, although they do exist (but are usually related in some way to Tibetan Buddhism). Almost all high religious writing involved calligraphy, including letters sent by the Dalai Lama and other religious and secular authority. Calligraphy is particularly evident on their prayer wheels, although this calligraphy was forged rather than scribed, much like Arab and Roman calligraphy is often found on buildings. Although originally done with a reed, Tibetan calligraphers now use chisel tipped pens and markers as well. 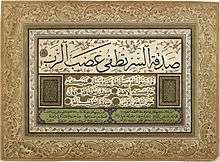 The phrase Basmala in an 18th-century Islamic calligraphy from the Ottoman region. Islamic calligraphy (calligraphy in Arabic is khatt ul-yad خط اليد‎) has evolved alongside Islam and the Arabic language. As it is based on Arabic letters, some call it "Arabic calligraphy". However the term "Islamic calligraphy" is a more appropriate term as it comprises all works of calligraphy by the Muslim calligraphers from Andalusia in modern Spain to China. Islamic calligraphy is associated with geometric Islamic art (arabesque) on the walls and ceilings of mosques as well as on the page. Contemporary artists in the Islamic world draw on the heritage of calligraphy to use calligraphic inscriptions or abstractions. 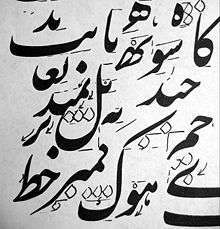 Instead of recalling something related to the spoken word, calligraphy for Muslims is a visible expression of the highest art of all, the art of the spiritual world. Calligraphy has arguably become the most venerated form of Islamic art because it provides a link between the languages of the Muslims with the religion of Islam. The Qur'an has played an important role in the development and evolution of the Arabic language, and by extension, calligraphy in the Arabic alphabet. Proverbs and passages from the Qur'an are still sources for Islamic calligraphy. 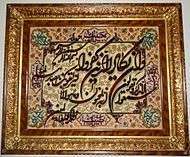 It is generally accepted that Islamic calligraphy excelled during the Ottoman era. Turkish calligraphers still present the most refined and creative works. Istanbul is an open exhibition hall for all kinds and varieties of calligraphy, from inscriptions in mosques to fountains, schools, houses, etc. 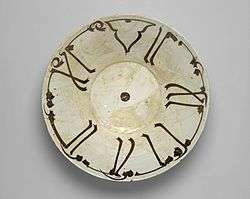 Bowl with Kufic Calligraphy, 10th century. Brooklyn Museum. The history of calligraphy in Persia dates back to the pre-Islam era. In Zoroastrianism beautiful and clear writings were always praised. It is believed that ancient Persian script was invented by about 600–500 BC to provide monument inscriptions for the Achaemenid kings. These scripts consisted of horizontal, vertical, and diagonal nail-shape letters, which is why it is called "script of nails/cuneiform script" (khat-e-mikhi) in Persian. Centuries later, other scripts such as "Pahlavi" and "Avestan" scripts were used in ancient Persia. 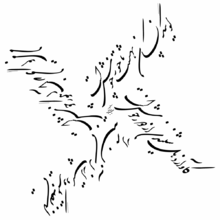 The Nasta'liq style is the most popular contemporary style among classical Persian calligraphy scripts; Persian calligraphers call it the "bride of calligraphy scripts". This calligraphy style has been based on such a strong structure that it has changed very little since. Mir Ali Tabrizi had found the optimum composition of the letters and graphical rules so it has just been fine-tuned during the past seven centuries. It has very strict rules for graphical shape of the letters and for combination of the letters, words, and composition of the whole calligraphy piece. Mayan calligraphy was expressed via Mayan hieroglyphs; modern Mayan calligraphy is mainly used on seals and monuments in the Yucatán Peninsula in Mexico. Mayan hieroglyphs are rarely used in government offices; however in Campeche, Yucatán and Quintana Roo, Mayan calligraphy is written in Latin letters. Some commercial companies in southern Mexico use Mayan hieroglyphs as symbols of their business. Some community associations and modern Mayan brotherhoods use Mayan hieroglyphs as symbols of their groups. Most of the archaeological sites in Mexico such as Chichen Itza, Labna, Uxmal, Edzna, Calakmul, etc. have glyphs in their structures. Carved stone monuments known as stele are common sources of ancient Mayan calligraphy. 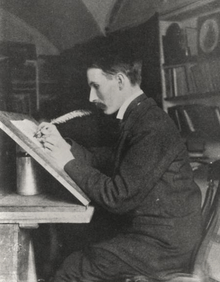 Edward Johnston, founder of modern western calligraphy, at work in 1902. After printing became ubiquitous from the 15th century, the production of illuminated manuscripts began to decline. However, the rise of printing did not mean the end of calligraphy. The modern revival of calligraphy began at the end of the 19th century, influenced by the aesthetics and philosophy of William Morris and the Arts and Crafts movement. Edward Johnston is regarded as being the father of modern calligraphy. After studying published copies of manuscripts by architect William Harrison Cowlishaw, he was introduced to William Lethaby in 1898, principal of the Central School of Arts and Crafts,who advised him to study manuscripts at the British Museum. This triggered Johnston's interest in the art of calligraphy with the use of a broad edged pen. He began a teaching course in calligraphy at the Central School in Southampton Row, London from September 1899, where he influenced the typeface designer and sculptor Eric Gill. He was commissioned by Frank Pick to design a new typeface for London Underground, still used today (with minor modifications). He has been credited for reviving the art of modern penmanship and lettering single-handedly through his books and teachings - his handbook on the subject, Writing & Illuminating, & Lettering (1906) was particularly influential on a generation of British typographers and calligraphers, including Graily Hewitt, Stanley Morison, Eric Gill and Anna Simons. Johnston also devised the simply crafted round calligraphic handwriting style, written with a broad pen, known today as the Foundational hand. Johnston initially taught his students an uncial hand using a flat pen angle, but later taught his hand using a slanted pen angle. He first referred to this hand as "Foundational Hand" in his 1909 publication, Manuscript & Inscription Letters for Schools and Classes and for the Use of Craftsmen. Graily Hewitt taught at the Central School of Arts and Crafts and published together with Johnston throughout the early part of the century. Hewitt was central to the revival of gilding in calligraphy, and his prolific output on type design also appeared between 1915 and 1943. He is attributed with the revival of gilding with gesso and gold leaf on vellum. Hewitt helped to found the Society of Scribes & Illuminators (SSI) in 1921, probably the world's foremost calligraphy society. An example of Graily Hewitt's calligraphy. Hewitt is not without both critics and supporters in his rendering of Cennino Cennini's medieval gesso recipes. Donald Jackson, a British calligrapher, has sourced his gesso recipes from earlier centuries a number of which are not presently in English translation. Graily Hewitt created the patent announcing the award to Prince Philip of the title of Duke of Edinburgh on November 19, 1947, the day before his marriage to Queen Elizabeth. Johnston’s pupil, Anna Simons, was instrumental in sparking off interest in calligraphy in Germany with her German translation of Writing and Illuminating, and Lettering in 1910. Austrian Rudolf Larisch, a teacher of lettering at the Vienna School of Art, published six lettering books that greatly influenced German-speaking calligraphers. Because German-speaking countries had not abandoned the Gothic hand in printing, Gothic also had a powerful effect on their styles. Rudolf Koch was a friend and younger contemporary of Larisch. Koch's books, type designs, and teaching made him one of the most influential calligraphers of the 20th century in northern Europe and later in the U.S. Larisch and Koch taught and inspired many European calligraphers, notably Karlgeorg Hoefer, and Hermann Zapf. Contemporary typefaces used by computers, from word processors like Microsoft Word or Apple Pages to professional designers' software like Adobe InDesign, owe a considerable debt to the past and to a small number of professional typeface designers today. Unicode provides "Script" and "Fraktur" Latin alphabets that can be used for calligraphy. See Mathematical Alphanumeric Symbols. A leaflet of the Dresden Codex written in the Mayan script on a type of paper called amatl. 1 2 3 4 Mediaville, Claude (1996). 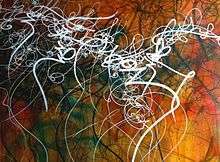 Calligraphy: From Calligraphy to Abstract Painting. Belgium: Scirpus-Publications. ISBN 9080332518. ↑ Pott, G. (2006). Kalligrafie: Intensiv Training [Calligraphy: Intensive Training] (in German). Verlag Hermann Schmidt. ISBN 9783874397001. ↑ Pott, G. (2005). Kalligrafie: Erste Hilfe und Schrift-Training mit Muster-Alphabeten (in German). Verlag Hermann Schmidt. ISBN 9783874396752. 1 2 Zapf, H. (2007). Alphabet Stories: A Chronicle of technical developments. Rochester, New York: Cary Graphic Arts Press. ISBN 9781933360225. ↑ Propfe, J. (2005). SchreibKunstRaume: Kalligraphie im Raum Verlag (in German). Munich: Callwey Verlag. ISBN 9783766716309. ↑ Geddes, A.; Dion, C. (2004). Miracle: a celebration of new life. Auckland: Photogenique Publishers. ISBN 9780740746963. ↑ Reaves, M.; Schulte, E. (2006). Brush Lettering: An instructional manual in Western brush calligraphy (Revised ed.). New York: Design Books. ↑ Child, H., ed. (1985). The Calligrapher's Handbook. Taplinger Publishing Co.
↑ Lamb, C.M., ed. (1976) . Calligrapher's Handbook. Pentalic. ↑ "Calligraphy Islamic website". Calligraphyislamic.com. Retrieved 2012-06-18. ↑ Sabard, V.; Geneslay, V.; Rébéna, L. (2004). Calligraphie latine: Initiation [Latin calligraphy: Introduction] (in French) (7th ed.). , Paris. pp. 8–11. ISBN 978-2215021308. 1 2 Lovett, Patricia (2000). Calligraphy and Illumination: A History and Practical Guide. Harry N. Abrams. ISBN 978-0810941199. 1 2 3 4 Joyce Irene Whalley (c. 1980). The Art of Calligraphy, Western Europe & America. ↑ Brown, M.P. (2004). Painted Labyrinth: The World of the Lindisfarne Gospel (Revised ed.). British Library. ↑ The Bible: New Living Translation. Tyndale House Publishers. 2000. ↑ 書 (Taiwanese) being here used as in 楷书 (Cantonese) or 楷書 (Taiwanese), meaning "writing style". 1 2 3 4 5 R. B. Blakney (2007). A Course in the Analysis of Chinese Characters. Lulu.com. p. 6. ISBN 978-1-897367-11-7. ↑ 康熙字典 [Kangxi Zidian] (in Chinese). 1716. p. 41. . See, for example, the radicals 卩, 厂, or 广. The 2007 common shape for those characters does not clearly show the stroke order, but old versions, visible on p. 41, clearly allow the stroke order to be determined. ↑ Suzuki, Yuuko (2005). An introduction to Japanese calligraphy. Tunbridge Wells: Search. ISBN 978-1844480579. ↑ Anderson, D. M. (2008). "Indic calligraphy". Encyclopædia Britannica 2008. .
↑ "Memory of the World | United Nations Educational, Scientific and Cultural Organization". UNESCO. Retrieved 2012-06-18. 1 2 "The Legacy of Edward Johnston". The Edward Johnston Foundation. ↑ "Font Designer — Edward Johnston". Linotype GmbH. Retrieved 5 November 2007. ↑ Henning, W.E. (2002). Melzer, P., ed. An Elegant Hand: The Golden Age of American Penmanship and Calligraphy. New Castle, Delaware: Oak Knoll Press. ISBN 978-1584560678. Diringer, D. (1968). The Alphabet: A Key to the History of Mankind. 1 (3rd ed.). London: Hutchinson & Co. p. 441. Fraser, M.; Kwiatowski, W. (2006). Ink and Gold: Islamic Calligraphy. London: Sam Fogg Ltd.
Mediavilla, Claude (2006). Histoire de la calligraphie française (in French). Paris: Michel. ISBN 978-2226172839. Shepherd, Margaret (2013). Learn World Calligraphy: Discover African, Arabic, Chinese, Ethiopic, Greek, Hebrew, Indian, Japanese, Korean, Mongolian, Russian, Thai, Tibetan Calligraphy, and Beyond. Crown Publishing Group. p. 192. ISBN 978-082308230-8. Schimmel, Annemarie (1984). Calligraphy and Islamic Culture. New York University Press. ISBN 9780814778302. Wikimedia Commons has media related to Calligraphy. Look up calligraphy in Wiktionary, the free dictionary. French Renaissance Paleography This is a scholarly maintained site that presents over 100 carefully selected French manuscripts from 1300 to 1700, with tools to decipher and transcribe them.